David Krejčí (Czech pronunciation: [ˈdavɪt ˈkrɛjtʃiː], born 28 April 1986) is a Czech professional ice hockey center serving as an alternate captain for the Boston Bruins of the National Hockey League (NHL). He was part of the Bruins Stanley Cup win in 2011 and led the NHL in points during the 2011 and 2013 Stanley Cup Playoffs. He was named to the Czech national team for the 2010 and 2014 Olympic teams. David Krejčí was the Boston Bruins' first pick in the third round of the 2004 NHL Entry Draft (63rd overall). He was drafted out of Czech junior leagues, having played for Kladno. Following his selection, he moved to North America to play major junior hockey in the Quebec Major Junior Hockey League (QMJHL) for the Gatineau Olympiques for two seasons. Krejčí turned pro in 2006–07, playing for the Bruins' American Hockey League (AHL) affiliate, the Providence Bruins. He played in his first NHL game on 30 January 2007, in a 7–1 loss against the Buffalo Sabres, but suffered a concussion from Buffalo's Adam Mair during his third shift. He recorded just 2:07 minutes of ice time. Krejčí played increasingly with Boston the following season, appearing in 56 NHL games to go with 25 games in Providence. On 19 February 2008, Krejčí was involved in a shootout tie-breaker round, in a Bruins road game against the Carolina Hurricanes, and scored to help the Bruins take the shootout 2–1. Krejčí's shootout tally would not, however, register as his first NHL goal, as shootout goals do not count towards a player's statistical totals. Krejčí scored his first official NHL goal a week later, on 26 February, against Martin Gerber of the Ottawa Senators, as the second Bruins goal in a 4–0 home-ice shutout. He finished his rookie NHL season with six goals and 27 points. Krejci with the Boston Bruins in February 2008 during the 2007–08 NHL season. In 2008–09, Krejčí scored his first NHL hat-trick on 18 December 2008, against the Toronto Maple Leafs. He registered his first two goals against starter Vesa Toskala and his third against Curtis Joseph in an 8–5 Bruins win. About the midpoint of that season, NESN's play-by-play TV announcer Jack Edwards for televised Bruins games gave Krejčí the nickname "The Matrix", due to his ability to slow down the pace of a game through his skating style and abilities on the ice. Before a game on 2 April 2009, Krejčí was named the winner of the Boston Bruins' 2009 Seventh Player Award. The award is given annually to the player who "goes beyond the call of duty and exceeds all expectations" throughout the course of the season. During the game, Krejčí assisted on a goal by Milan Lucic, the 2008 winner of the Seventh Player Award, in a 2–1 home ice victory over the Ottawa Senators. He completed his second NHL season with 73 points in 82 games to go with a league-high +37 plus-minus rating. In 2008–09, Krejčí had a career-high 73 points in the regular season. On 2 June 2009, he signed a multi-year contract extension with the Bruins, reportedly a three-year deal averaging $3.75 million a year. At the beginning of November 2009, Krejčí was noticeably ill, and this was confirmed on 5 November 2009, with a diagnosis of infection with the H1N1 virus, which sidelined Krejčí for a period of time. On 5 May 2010, during the Stanley Cup playoffs, Krejčí dislocated his wrist less than five minutes into a game when he was leveled at the Bruins' blue line by Philadelphia Flyers' centre Mike Richards. Surgery was needed and was performed following the game at Union Memorial Hospital in Baltimore, and Krejčí missed the remainder of the playoffs. On 25 May 2011, Krejčí recorded his second NHL career hat-trick against the Tampa Bay Lightning during Game 6 of the Eastern Conference Finals in the playoffs. He was the first Bruin to record a playoff hat-trick since Cam Neely, two decades prior. On 15 June, Krejčí and the Bruins won the team's first Stanley Cup in 39 years, beating the Vancouver Canucks 4–0 in Game 7. Krejčí finished the 2011 playoffs with an NHL-leading 12 goals, 23 points and four game-winning goals. On 1 March 2012, Krejčí got his third career hat-trick versus the New Jersey Devils. He scored goals in the first, third and overtime period in a 4–3 win. In the fourth game of the 2013 opening round playoffs against the Toronto Maple Leafs, Krejčí scored a hat-trick, including the game-winning goal in overtime. On 1 October 2013, Krejčí was named an alternate captain of the Bruins. On 25 October 2013, Krejčí scored a game-winning goal with 0.8 seconds left against the San Jose Sharks and goaltender Antti Niemi. On 3 September 2014, Krejčí signed a six-year extension with the Bruins. During a road game on 20 February 2015 against the St. Louis Blues, Krejčí suffered a partial tear of his MCL in his left knee, forcing him off the ice for 4–6 weeks for a recovery. During the Bruins' home game against the Toronto Maple Leafs on 8 December 2018, Krejčí became the tenth-highest scoring Bruins' player of all-time, surpassing Cam Neely, when he recorded a goal and an assist in a 6–3 Bruins' win, bringing his points' total to 592. Three days later, on 11 December, Krejčí played his 800th NHL game, recording three assists in a Bruins' 4–3 home win over the Arizona Coyotes. Just one week later, on December 20, 2018, Krejčí scored his 600th career NHL point, as the third Bruins goal en route to a 4–1 home ice defeat of the Anaheim Ducks. After the Bruins' 2007–08 season ended, Krejčí was named to the Czech national team on 26 April 2008, for the 2008 IIHF World Championships. He was named to the Czech national team for the 2010 Winter Olympics, playing center on a line with wingers Tomáš Fleischmann and Martin Erat to open the Games. Following the Bruins defeat by the Tampa Bay Lightning in the second round of the 2018 Stanley Cup playoffs, Krejci was invited to participate at the 2018 IIHF World Championship. ^ a b "David Krejci". hockeydb.com. Retrieved 10 February 2013. ^ "Shootout Summary". Nh1.com. Retrieved 8 November 2014. ^ "Chat Transcript: David Krejci". Boston Bruins. 25 February 2009. Retrieved 20 October 2015. ^ "Krejci gets extension from B's". ESPN. 3 June 2009. Retrieved 8 November 2014. ^ "BRUINS UPDATE ON DAVID KREJCI". Bruins.nhl.com. Retrieved 8 November 2014. ^ "David Krejci's goal nets Sharks". Boston Herald. 25 October 2013. Retrieved 25 October 2013. 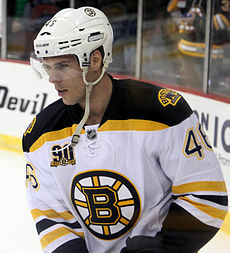 ^ "David Krejci signs extension with Bruins". Boston Globe. 3 September 2014. Retrieved 3 September 2014. ^ "Krejci to Miss 4–6 Weeks with a Partially Torn MCL". bruins.nhl.com. Boston Bruins. 23 February 2015. Retrieved 13 March 2015. ^ Russo, Eric (8 December 2018). "Team Effort Spurs Bruins in Win Over Leafs". NHL.com. Retrieved 9 December 2018. But it was David Krejci's evening that stood out. ... The pivot's two-point output - while centering Marchand and Pastrnak - pushed him past Cam Neely for 10th place on the Bruins' all-time scoring list with 592 points. Krejci leapfrogged Boston's president with an assist on Krug's second-period tally and later added his fourth goal of the season - and second in the last two games - to extend the Bruins' lead to 5-1 at 4:37 of the third. ^ Russo, Eric (11 December 2018). "Krejci Connecting With Bruins Top Line". NHL.com. Retrieved 13 December 2018. But to Marchand and Pastrnak, it was Krejci - playing in his 800th career game - who made the line go. The 32-year-old pivot, twice the NHL's leading playoff scoring, picked up helpers on all three goals, with each play prettier than the next. ^ Kalman, Matt (20 December 2018). "Pastrnak has three points, Bruins top Ducks". nhl.com/bruins. National Hockey League. Retrieved 1 January 2019. David Krejci extended the lead to 3-0 at 5:21 of the third period. After Marchand lost the puck, Pastrnak recovered it, skated back toward the top of the circle and fed Krejci for a one-timer from the top of the right circle..."Yeah, I was looking for a one-timer, I was coming late," said Krejci, whose goal was his 600th NHL point. ^ "HOME". Iihf.com. Retrieved 8 November 2014. ^ "Bruins Pastrnak, Krejci to join Czechs at ice hockey worlds". sportsnet.ca. 9 May 2018. Retrieved 9 May 2018. ^ "Czech Torch Passed: Krejci Wins Golden Stick". Stanley Cup of Chowder. Retrieved 2 July 2018. ^ "Krejci Wins NESN's Seventh Player Award". NHL.com. Retrieved 2 July 2018.